The concrete jungle – New York City – is more than 72 percent impermeable, covered with asphalt, steel and other surfaces that have limited ability to absorb rainfall. Increasingly heavy rains associated with climate change (as we saw during Hurricane Sandy) cause our sewer system to be overwhelmed. Sewer overflows and polluted stormwater runoff pour into the city’s waterways, endangering wetlands and natural systems that provide flood protection, reducing the quality of life for residents who use the city’s waters for recreation and causing costly damage to the city’s climate resiliency. A new report from the NYU Stern Center for Sustainable Business and the Natural Resources Defense Council (NRDC) examines New York City’s water quality challenge – reducing the 20 billion gallons of sewage overflows and polluted stormwater runoff flowing into waterways annually while navigating more than 150,000 acres of land mass covered by impervious asphalt and concrete. The City’s Department of Environmental Protection (DEP) is committed to green-infrastructure initiatives as a critical component of its water quality mandates and broader sustainability goals. Over the course of nineteen months, the Center and NRDC consulted with DEP to aid in the development and launch of an innovative, large-scale, community-supported grant program to spur green-infrastructure construction on private property, which makes up more than half of the City’s land area. Though investment in green infrastructure is only one component in a complementary suite of strategies the City can pursue to address sewage overflows, it is one that presents enormous co-benefits for all New Yorkers. Greening NYC can help the city absorb more water and carbon, it can reduce the “heat island effect” and it can beautify neighborhoods. The report outlines a number of key recommendations to help the City and DEP create a successful grant program to catalyze the construction of green infrastructure on private property; fulfill the sustainability, equity and resiliency goals outlined in Mayor DeBlasio’s OneNYC plan; and enable fair regulations to stimulate investment in green infrastructure throughout the City. 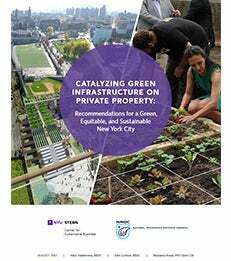 Commit to, and communicate actively about, making green infrastructure on private property a core component of New York City’s sustainability efforts. Provide a direct financial benefit, such as compensation for long-term green-infrastructure maintenance and on-bill loan financing, to private property owners who invest in green infrastructure through the creation of a new grant program. Partner with community-based organizations to help the new program successfully achieve OneNYC goals.